The PowerShares QQQ (QQQ) which tracks the Nasdaq 100 has returned the best returns among diversified ETFs over multiple time periods. QQQ primarily tracks “new economy” stocks while the S&P 500 ETFs also track old economy stocks. The current decline has reached a first support level and a small position in QQQ for those without can be taken now. 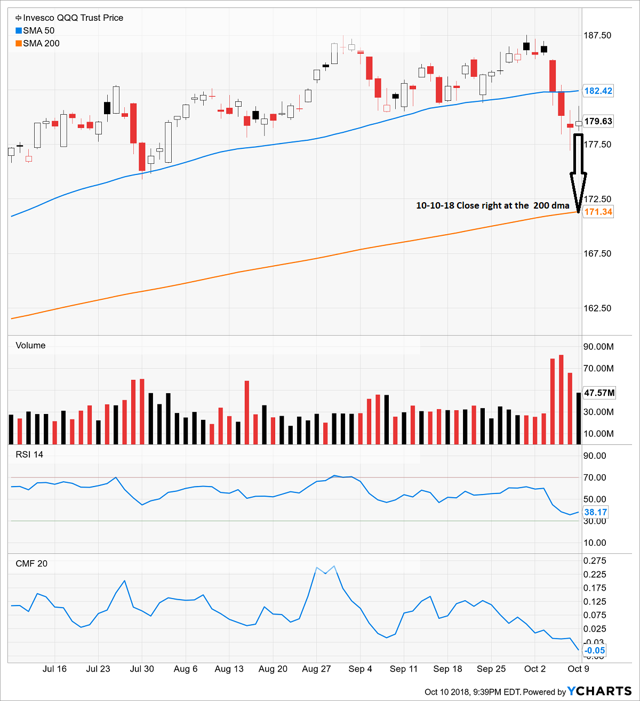 This idea is specifically for investors with small positions or no current position in the PowerShares QQQ ETF (QQQ). QQQ is the ideal core holding for a diversified portfolio. Using limit orders to buy it on correlated market declines, like this week, is also a very simplified way to efficiently and easily build a position in a basket of economy leading companies and their market leading stocks. The PowerShares QQQ tracks the NASDAQ 100 with a market cap weighted asset allocation. That means that the bigger companies represent more of the index and get more of the capital inflows from investors purchasing the ETF. So, as you invest, you are systematically gaining more exposure to the companies with larger market caps. 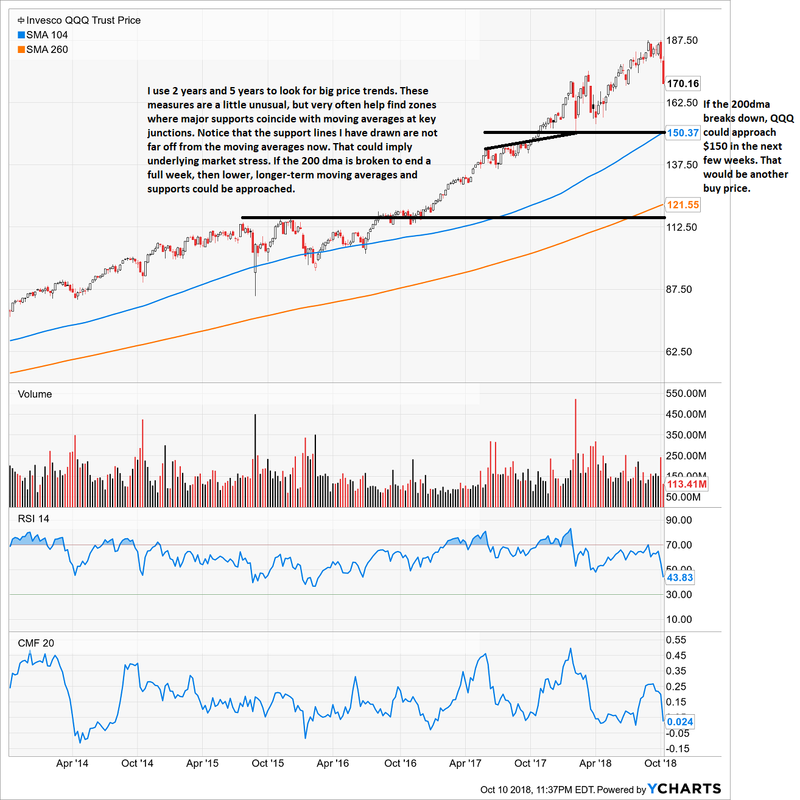 Below, it is important to note that buying QQQ gives you substantial positions in five stocks that make up nearly half of the portfolio: Apple (AAPL), Amazon (AMZN), Microsoft (MSFT), Alphabet-Google (GOOG) (GOOGL) and Facebook (FB). 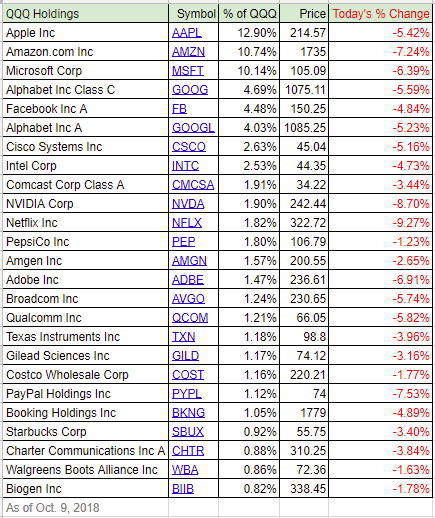 These are fine companies to buy as a basket, especially on a correction. As you can see, on October 9th (today), the holdings in QQQ took a substantial decline of about 4% on the day in aggregate. Over the past few weeks however, a deeper correction has played out. The breakdown in QQQ very possibly is reaching its nadir right now. As I have discussed previously, the biggest companies in the index also have authorized but unused buybacks available to buy shares once earnings are over (they can make previously planned purchases in the days leading up to earnings, but not discretionary until after). It is my belief we see a huge Santa Rally this year as those buybacks are put to use. 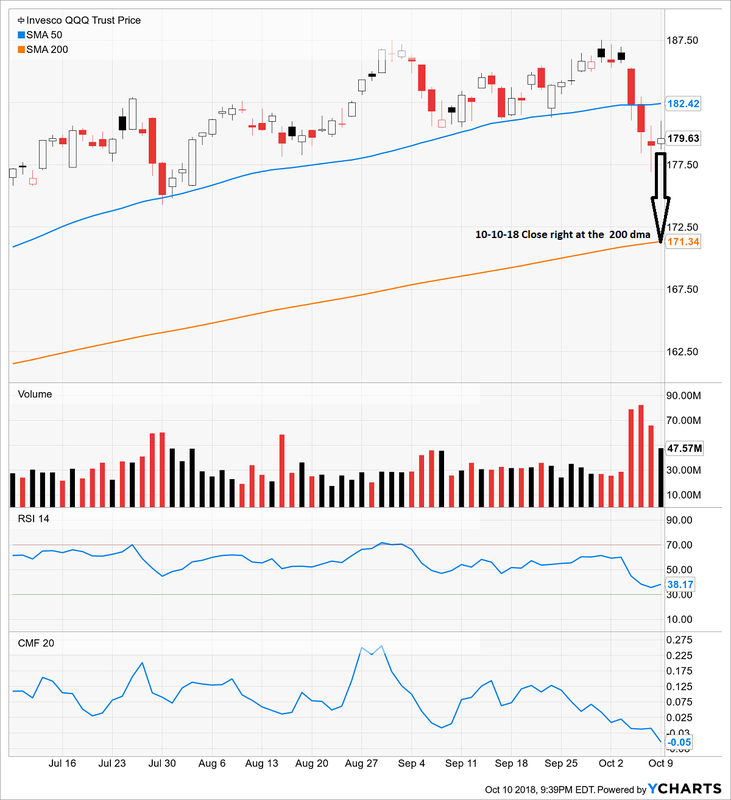 The technical breakdown is demonstrated by a steep falloff in money flow the past couple weeks. The RSI is nearly extremely oversold and another down day or two very likely could bring in value hunters. Volume on the 9th was 3x average volume so the correction has momentum. The first support level, the 200 day moving average is being breached. If there is not some recovery above that level by this Friday at the close or next Friday at the close, that would imply further to fall. Next week will be key, however, a close above the 200 dma average this week would likely mean next week would be favorable. Where could QQQ head to? Well, if there is further technical damage between this Friday and next Friday, there is a lot of downside possible. We will have to be cautious, but a slow scaling in strategy can be employed here if you are not afraid of the “next big one” yet. I have a buy order in for QQQ at $169 GTC. As of tonight, the futures are pointing down about 1%. That implies some follow through to the downside in the morning, but not the type of panic that a real bear market would instill. Remember, the economy is still strong. The reason I am using that magnitude is that the larger the initial sell-off Thursday morning, the more fearful I am that there is even more follow through Friday morning. Also, the lower buy limits give me time to adjust my thinking by watching and listening to the markets.